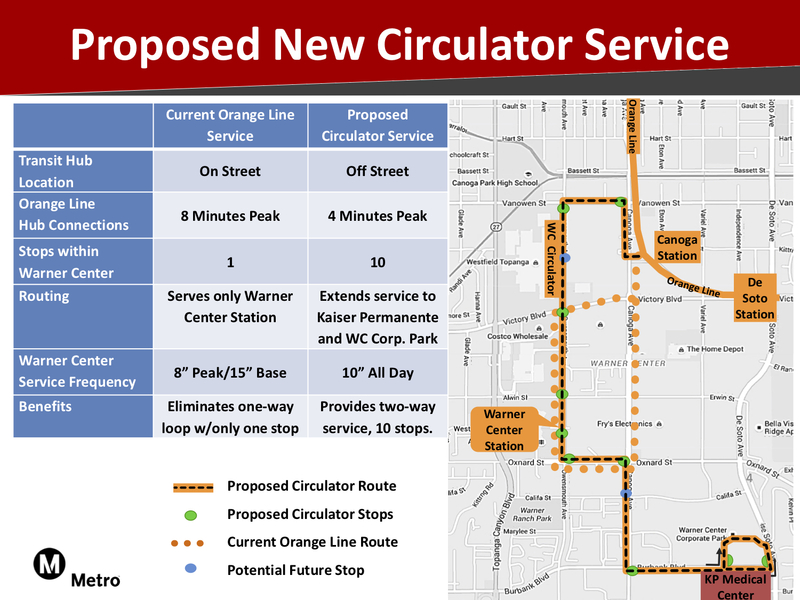 A new bus circulator with more stops and that travels in both directions will replace current Orange Line service in the Warner Center area later this year. The plan was unanimously approved by the San Fernando Valley Service Council at Wednesday night’s meeting — with support from the Valley Industry & Commerce Assn., the Warner Center Assn. and the office of Los Angeles Council Member Bob Blumenfield. The vote clears the way for the change to be implemented in June. 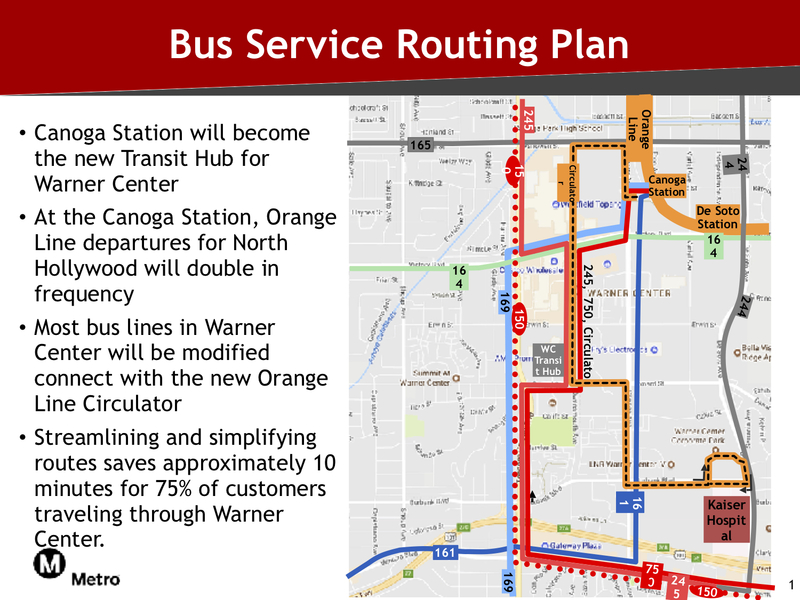 Orange Line buses will operate between North Hollywood and Chatsworth with a transfer to/from the new shuttle at the Orange Line’s Canoga Station. In other words, Orange Line buses will no longer directly serve Warner Center in a big counter-clockwise loop with only one stop. The upside: the shuttle will travel in both directions, run every 10 minutes all day and have 10 stops instead of one. The above map shows the change, prompted by the desire to serve more locations in Warner Center and boost ridership by making the Orange Line a more attractive option. The plan also involves modifying the routes of five Metro Bus lines that serve the area — the 150, 161, 164, 169 and 750. See the map below. As part of the change, Metro will have a significant public outreach campaign this spring. The change is targeted for the semi-annual bus changes that occur every June. Your thoughts, Orange Line riders and Warner Center residents/workers/visitors? The old idea of running a loop was at least easy to understand. The new circulator provides more access, with all the stops, but is also slower with all the turns. If you can deal with the pedestrian hostile San Fernando Valley walking environment, just walking from De Soto to Kaiser would be faster than riding one more stop to Canoga and transferring to a bus that has to make six turning movements. And that 10 minute service is not going to last, because Warner Center is an office type environment. I can’t see many people riding at 10 am or on the weekends, so you’re going to have empty buses driving around. Better to have rerouted the 245 closer to Canoga and Vanowen, have the 150 run to Sherman Way station (since there was a desire to not have it deviate through). Does this now mean that Orange Line buses that formally served Warner Center will now serve Chatsworth? Or will they be turned back at some intermediate stop? I am concerned about different headways on the two routes. This could result in many missed connections Instead, the shuttle should be required to,wait for an Orange Line bus before proceeding. Having to get off the Orange Line and wait, possibly for ten minutes, for a bus to get to Warner Center seems like a rather dismal prospect. What if the wait is even longer? I had to wait for 35 minutes for a bus on Beverly Blvd. last week at a time when buses are supposed to arrive approximately every 12 minutes. It isn’t really surprising that Metro ridership is dropping. Will Metro be operating the circulator, (new?) LADOT DASH route, The Link, or some type of transportation company like MV Transportation, First Transit, etc.? Well it’s a circulator/shuttle route. It will designated as a 600 line. So it won’t have a color to show up on major route maps. You know, if this fails to work, Metro could very well use this as a template for why ridership is falling year by year. If this works out however, then obviously it’s a system that should be looked into more and be used as a template for how transfers can work with very little to no dwell time (2-5 min), possibly increasing ridership just a bit. Ball is your court with this one Metro. The reason behind the circulator bus is to prepare the Orange Line ROW for exclusive battery electric bus service and the future conversion to light rail as neither electric buses nor trains will serve Warner Center. The service pattern will now only be Chatsworth – North Hollywood. The added benefit to the circulator bus is the additional stops it provides in the area. This will be helpful when it comes to electrifying the Orange Line. But the real goal here is to improve ridership and make the Orange Line more user-friendly for those who live/work/play in the Warner Center area. As with any service change, some folks may lose the one-seat ride to/from Warner Center. But I think in the long run this will ultimately provide service that attracts more riders. One good thing about buses is you can try things such as this without having to build new roads or tracks, etc. The map doesn’t extend to Winnetka on Victory which is the Pierce College stop, which is one of the busiest, correct? Does that mean that it’s not included in the loop? The Pierce College Station is not affected by the new bus shuttle. Service will continue there as usual.